The life boy photo from Dennistoun? The church is down the road from Alexandra Parade primary School. Church was converted some years ago to flats. My brother Michael and I were in the life boys from 1954 to 1956. Thanks a huge amount for loading the picture. Regards johnnd in NZ. We were only 9 and 10 when welfare came and kidnapped us from what we thought were our Mum and Dad (Foster parents) and rehoused us in Aberdeen. We joined a BB company in Aberdeen. 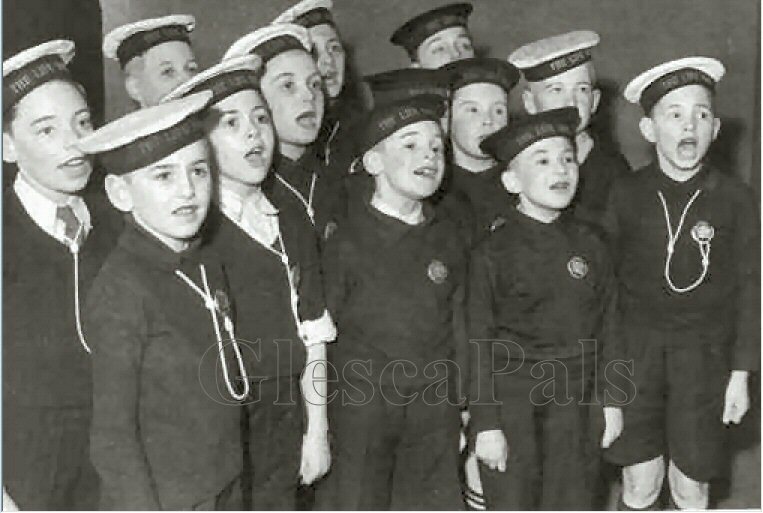 As the Dennistoun photo is of 9 year old's ?, AND I LIKED SINGING, I am possibly in the bunch of choristers :) I can be identified by my "Hairstyle"?. But this lot have their wee hats on. I have seen class photo's of the Alexandra parade primary school on line and my class photo is their, but no names. Most of the boys in the photo went to the life boys. We were a grand sight, according to neighbour's, as we strode doon the street to the life boys, so we were. One year I won second prize as a Pirate and the next year won first prize as Sir Walter Raleigh Wore my mums nylons and she converted a paid of silk knickers with ribbons and tassels for "shorts" they English used to wear!. These were for the Christmas parties. Aged 9 yrs was tripped over and sent flying across the polished floor and smack into the wall under the seating and broke my right wrist. I'm amazed at the memory trip I'm having at age 64 !! Thank you very much for the reviving of fond memories. Thank you very much and my best regards, Johnn Donaldson in NZ. white rope lanyard hooked over it.